During rain or irrigation, the fields become wet. The water infiltrates into the soil and is stored in its pores. When all the pores are filled with water, the soil is said to be saturated and no more water can be absorbed; when rain or irrigation continues, pools may form on the soil surface (Fig. 96). Fig. 96. During heavy rainfall the upper soil layers become saturated and pools may form. Water percolates to deeper layers and infiltrates from the pools. Part of the water present in the saturated upper soil layers flows downward into deeper layers and is replaced by water infiltrating from the surface pools. When there is no more water left on the soil surface, the downward flow continues for a while and air re-enters in the pores of the soil. This soil is not saturated anymore. However, saturation may have lasted too long for the plants' health. Plant roots require air as well as water and most plants cannot withstand saturated soil for long periods (rice is an exception). Besides damage to the crop, a very wet soil makes the use of machinery difficult, if not impossible. The water flowing from the saturated soil downward to deeper layers, feeds the groundwater reservoir. As a result, the groundwater level (often called groundwater table or simply water table) rises. Following heavy rainfall or continuous over-irrigation, the groundwater table may even reach and saturate part of the rootzone (see Fig. 97). Again, if this situation lasts too long, the plants may suffer. Measures to control the rise of the water table are thus necessary. The removal of excess water either from the ground surface or from the rootzone, is called drainage. Excess water may be caused by rainfall or by using too much irrigation water, but may also have other origins such as canal seepage or floods. In very dry areas there is often accumulation of salts in the soil. Most crops do not grow well on salty soil. Salts can be washed out by percolating irrigation water through the rootzone of the crops. To achieve sufficient percolation, farmers will apply more water to the field than the crops need. But the salty percolation water will cause the water table to rise. Drainage to control the water table, therefore, also serves to control the salinity of the soil (see Chapter 7). Drainage can be either natural or artificial. Many areas have some natural drainage; this means that excess water flows from the farmers' fields to swamps or to lakes and rivers. Natural drainage, however, is often inadequate and artificial or man-made drainage is required. There are two types of artificial drainage: surface drainage and subsurface drainage. Surface drainage is the removal of excess water from the surface of the land. This is normally accomplished by shallow ditches, also called open drains. The shallow ditches discharge into larger and deeper collector drains. In order to facilitate the flow of excess water toward the drains, the field is given an artificial slope by means of land grading (see Fig. 98). The excess water from the rootzone flows into the open drains (see Fig. 99). The disadvantage of this type of subsurface drainage is that it makes the use of machinery difficult. Pipe drains are buried pipes with openings through which the soil water can enter. The pipes convey the water to a collector drain (see Fig. 100). Drain pipes are made of clay, concrete or plastic. They are usually placed in trenches by machines. 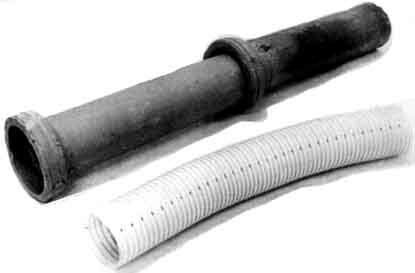 In clay and concrete pipes (usually 30 cm long and 5 - 10 cm in diameter) drainage water enters the pipes through the joints (see Fig. 101, top). Flexible plastic drains are much longer (up to 200 m) and the water enters through perforations distributed over the entire length of the pipe (see Fig. 101, bottom). Open drains use land that otherwise could be used for crops. They restrict the use of machines. They also require a large number of bridges and culverts for road crossings and access to the fields. Open drains require frequent maintenance (weed control, repairs, etc.). In contrast to open drains, buried pipes cause no loss of cultivable land and maintenance requirements are very limited. The installation costs, however, of pipe drains may be higher due to the materials, the equipment and the skilled manpower involved.